Co-commissioned by 14-18 NOW, the UK’s arts program for the First World War centenary, XENOS is billed as a commemoration of an Indian soldier in the trenches representing the more than a million mobilized from what was then a colony of the British Empire. 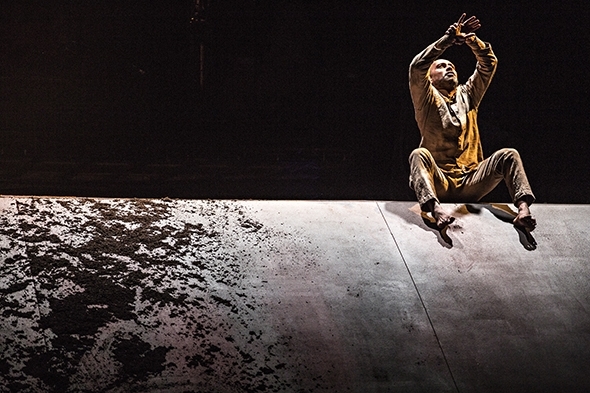 But it is also billed as the final full-length solo Akram Khan will choreograph on himself. So what, or who, is XENOS actually commemorating? Sarah Crompton titles her program article, ‘A new myth’ in which she discusses with Khan the making of XENOS, its creative components and the summation of his career. She concludes that the new myth is ‘to help everyone remember.’ Remember what? Both Khan’s role and the production itself are equivocal in their response. Even though Khan was born in a south London borough to Bangladeshi parents, his dancing roots are in his classical kathak training, which makes his portrayal of ‘X’ — who dramaturg Ruth Little describes as ‘no man and everyman, the unknown and the eternal soldier, alone in a foreign land…’ — unquestionably poignant. The opening of XENOS (meaning ‘foreigner’ or ‘stranger’) is a masterful depiction of ‘X’ at the convergence of dance and conflict. As we arrive in the auditorium of Sadler’s Wells, vocalist Aditya Prakash and percussionist BC Manjunath are seated on stage performing a classical concert unperturbed by our lack of attention. Mirella Weingarten’s set is a study in absence: empty, dusty chairs, an abandoned swing and a low table covered in a fine layer of earth below a string of bare light bulbs and an array of ropes leading up an incline towards the back. It is a deserted interior scene that anticipates the passing of the present into a bleak future. It is only with an amplified electrical short circuit and a temporary blackout that the audience becomes attentive and subsides into silence; the concert continues and Khan enters as if discharged violently from a traumatic past. The music serves to revive him and he begins a haltingly remembered kathak dance; at times Manjunath has to prompt him with the chanted rhythms and the three men build up a haunting image of life interrupted and changed forever. Khan is in a sense playing himself, remembering past glories from a conflicted present, his mature body reliving what it could once do so effortlessly. More electrical short circuits and an extended black out lead us to a plangent space and time where the snake-like ropes draw Khan and all the furniture inexorably up the slope as if by an outside force — the original tug of war — and over the top. The parapet remains throughout XENOS as the locus of the trenches and of Khan’s place in this desolate world; he connects a rope like a field cable to what appears to be a gramophone to hear a crackly recording of the names of fallen Indian soldiers, one of whom died laying cables in the mud. The horn of the gramophone later becomes a searchlight, but with these surreal allusions the connection to the First World War begins to veer off into the discursive themes of myth and evolution. Khan invokes Prometheus, the Greek Titan who is credited with the creation of man from clay and who stole fire from Zeus to facilitate the development of civilization — and its unintended consequence, war. Khan’s depiction of evolution seems to cover the period from Mowgli to the Mahabharata, subtly shifting the focus of XENOS from the representation of colonial ‘X’ into the current myth of Khan himself. It’s as if ‘X’ has offloaded his ‘otherness’ and has returned home, which is now in Wimbledon. In the Crompton interview, Khan acknowledges an Indian academic who had thought remembrance was ‘a white thing’. This notion had spurred Khan to delve into the archives of Indian involvement in the First World War, which in turn imbued his empathetic memorialization of ‘X’ at the beginning of XENOS. However, any further attempt at excavating the memory of these forgotten soldiers from oblivion is lost in the meandering rhetoric and the ‘whiteness’ of this lavish monument of a production. By the time lighting designer Michael Hulls, composer Vincenzo Lamagna and sound engineer Julien Deloison introduce that glorious go-to expression of sorrowful beauty, Mozart’s Lacrimosa from his Requiem mass, blasted from a Schechtian gallery of musicians suspended in light above the stage, the commemoration has turned fully on Kahn: the end of the war has become conflated with the end of his solo career.